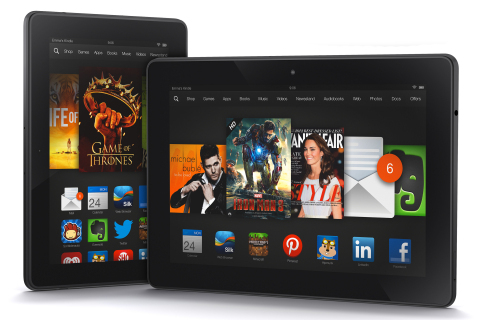 Amazon has unveiled its new line of Kindle Fire tablets. The 7" Kindle Fire HDX (starting at $229) will begin shipping October 18 (a $329 4G version ships November 14); and the 8.9" Kindle Fire HDX starts at $379 and ships November 7 (a $479 4G version ships December 10). Amazon is touting Fire OS 3.0 "Mojito," the latest version of its operating system, as well as the addition of new features and services like Second Screen, which turns a television into the primary screen and will be available starting next month for PlayStation 3 and Samsung TVs; and the Mayday button, which promises free on-device tech support 24/7. "Initially, a lot of people will use it just to show it off," Bezos told AllThingsD regarding the Mayday button. "We want to encourage that. It's a 'wow' feature." CNet called the Fire tablets and new Fire OS "incredibly ambitious, but until we spend more than just a few minutes with them, we won't know for sure how well they live up to their potential."